Gold futures tacked on firm gains in normal trading Wednesday, then gave them and more back in after-hours trade when the Fed released its latest monetary policy statement. Gold for December delivery advanced $10.30, or 0.9%, to close at $1,176.10 an ounce on the Comex division of the New York Mercantile Exchange. The settlement was the highest since Oct. 20. 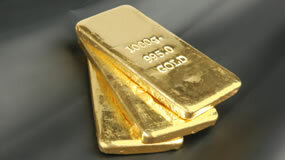 In electronic trading after the Fed news, however, gold prices fell toward $1,156 an ounce. "Most of the marketplace did not expect the Fed to raise U.S. interest rates at this week’s meeting," Jim Wyckoff, a senior analyst at Kitco Metals Inc., said in a report. "In fact, recent downbeat world economic data had much of the marketplace thinking the Fed will not move to raise interest rates at its December meeting. Thus, the FOMC statement ‘wrong-footed’ the marketplace." While the Fed did not raise interest rates, it did signal that its concerns about the economy have diminished and it left open the possibility of an increase in December. Silver for December delivery jumped 47 cents, or 2.7%, to close at $16.29 an ounce. Silver prices traded from $15.84 to $16.37. The precious metal was last near $16 an ounce in after-hours trading. January platinum gained $23.60, or 2.4%, to $1,012.80 an ounce, ranging from $986.50 to $1,015. Palladium for December delivery rose $7.35, or 1.1%, to $686.10 an ounce, trading between $676.70 and $692.50. Gold added $13.90, or 1.2%, to $1,179.60 an ounce. Silver climbed 23 cents, or 1.5%, to $16.03 an ounce. Atypically, United States Mint bullion sales have remained unchanged since Thursday, Oct. 22. Below is a listing of United States Mint bullion products with the number of coins sold during varying periods. Products with an asterisk (*) are no longer available.